Last week, Republican senators used what is called the “nuclear option” to reduce debate time on most presidential nominees. This means more of President Trump’s lower-level nominees will be confirmed to federal courts and agencies more quickly. It also marks the third time in less than a decade that the controversial tool has been used in the Senate, setting a new precedent for its deployment and further jeopardizing the future of the filibuster. 1. Reducing debate time allows a determined majority of the Senate vote to break, or change, the chamber’s rules, according to Vox. This strategy, which must be invoked by the majority party, would today help increase the odds that more of President Trump’s high-priority legislation could be passed. The president has repeatedly voiced his support for the nuclear option. 2. Use of the option began six years ago during the Obama administration to vote more expeditiously on federal judges and presidential nominees, The Washington Post reports. In 2017, Republicans used the nuclear option to end the Democratic filibuster on Supreme Court nominee Neil Gorsuch to ultimately have him confirmed. 3. 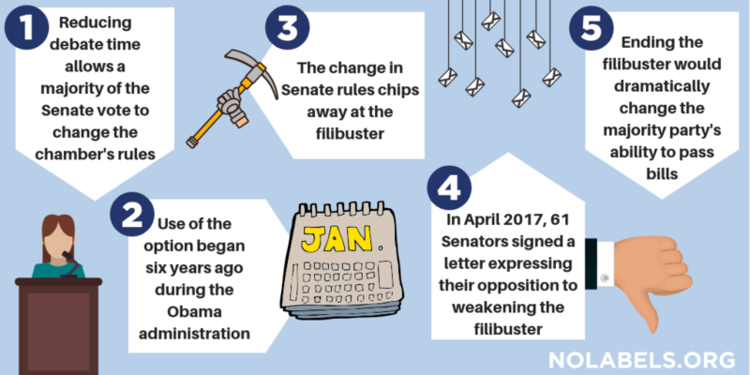 The change in Senate rules chips away at the filibuster, the act of refusing to end debate and vote on a bill. The filibuster is designed to promote bipartisanship; since the 19th century, filibusters have been used to ensure that the opinions of the Senate’s minority party were understood. Today in the Senate, there is a 60-vote supermajority requirement to end debate on a bill. 4. In April 2017, 61 Senators signed a letter expressing their opposition to weakening the filibuster. Of the letter’s signees, 32 were Democrats and 29 were Republicans. In the letter, the lawmakers cited the need to continue engaging in “full, robust, and extended debate” that the filibuster permits. 5. Last week, presidential candidate Sen. Elizabeth Warren announced that she would end the filibuster if she is elected. This would dramatically change the majority party’s ability to pass bills. Democratic presidential candidates Mayor Pete Buttigieg and Gov. Jay Inslee agree with Sen. Warren, but Sens. Cory Booker and Bernie Sanders say they don’t believe the filibuster should be changed. Sens. Kamala Harris and Kirsten Gillibrand have both expressed hesitancy in changing the law, but have not come to a final decision. However, the future of the filibuster is ultimately in the hands of the Senate.